The Garmin Varia Radar Tail Light is a step up in rear light game. The world's first cycling radar, Varia helps create a safe cycling environment by warning cyclists of vehicles approaching from behind up to 140 meters! The radar tail light also warns approaching vehicles of a cyclist ahead, the light will alter its beam brightness and flashing mode in comparison to how close the following vehicle is getting. This gives the driver behind plenty of warning so there will be no excuses. Works seamlessly with compatible Edge cycling computers (Edge 1000, 820, 520). The compatible Edge computer can show multiple approaching vehicles and indicates the relative speed of approach and threat level warning you in advance if you should take evasive action to stay safe. Overall this the next generation in taillights and will keep you seen at all the right times. Thought this was a bit expensive as I was only replacing a lost light, but thought it looked interesting after watching the video on the Garmin website. It works just great, picks up anything from a fair way back on a straight road. Especially useful when the wind is whistling in your ear. 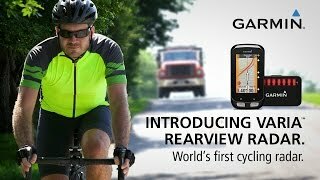 Garmin provides performance racers and touring cyclists with excellent technology that’s reliable and trust worthy, helping you to record and analysis all your training data under one roof. Market leader in navigation, creating computers to finely tuned accessories compelling in design and quality.